E56 – Summer Special 2: Sophie Pedder (The Economist) – So French! For our Summer Series we sat down with Sophie Pedder, the Paris Bureau Chief of The Economist. Over the last couple of years, she interviewed Macron several times. 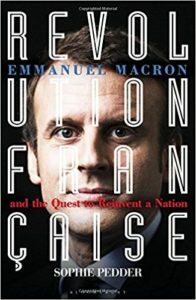 Her new book is called Revolution Française: Emmanuel Macron and the Quest to Reinvent a Nation. We had a very interesting and entertaining conversation with Sophie on President Macron, but also about the challenges of living in France and about Brexit. Note: This Episode was recorded a couple of days before the story of #Benallagate broke, the scandal that seriously tarnished Macron’s image as the Wonder Boy of European politics. E55 – Summer Special 1: Stephen Clarke – Vive la French Revolution!